In 1952, disabled Russian veterans of World War II (or the “Great Patriotic War” as it was called in the USSR) received their long-overdue motorized transportation in the form of a government provided open three-wheeler, the SL1. Built by a motorbike company in Serpukhov, the light vehicle proved that having only 3 wheels was an impractical choice for the Russian snow, sleet, and mud. 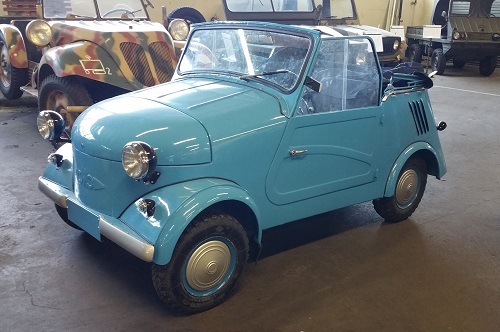 Therefore, in 1958, the 4-wheeled, open-topped SMZ appeared. It could do 25 mph instead of the previous model’s 12.4 mph and featured front torsion bar suspension attached to a tubular frame. Two different models were manufactured: the S3A seen here, for driving with two hands, and the SZB for driving with one hand and one leg. In the Soviet Union, they were commonly called “motor-wheelchairs” (or invalidka in Russian) and were only available through the social care system, leased for up to 5 years. The S3A was manufactured until 1970 when it was replaced by a modernized S3D version.